If April showers bring May flowers then maybe rain in September brings a winter we'll remember? Eh? Ok, I'm no poet, but all I know is that the changing colors and colder temps are making me more and more excited for this winter. Twelve dogs are in training (13 if I count Stormy), and we're all celebrating the coming of cold. After running all the "adults" (big air quotes) in harness this morning, it was Fenton and the Outlaw's turn for a romp. Rain and puddles didn't seem to slow them down. Each pup is developing their own personality and identity. Belle is the smallest and also one of the sassiest. She loves to play with the pup-sitters, Jezzy and Stormy. In particular, she loves to jump up, snag Jezzy by her griffon beard, and hang. I keep trying to snap a picture, but Jezzy doesn't put up with Belle's antics for long. CJ is Miss Independent. 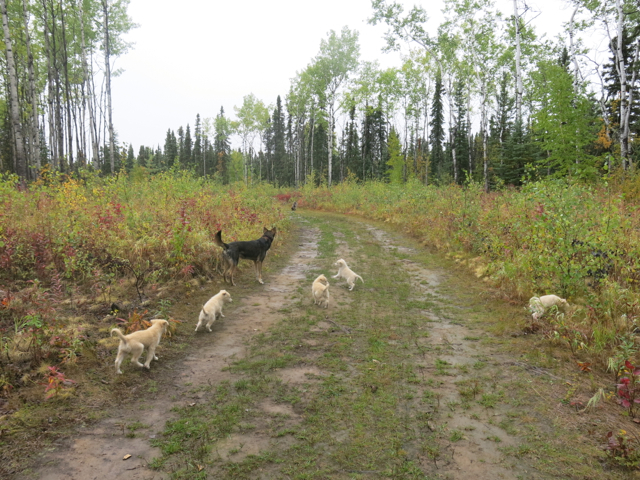 During puppy walks, it can sometimes be difficult to focus her attention on moving with the group. Pancho is the biggest boy and the most affectionate. He's also the most confident of the litter. Lefty can be shy, but warms up quickly. He likes to stay close and eat everything in sight. Fenton is vocal. He barks, howls, and talks constantly.